The honey-flavored syrupy jam that drips from a fresh fig is well worth seeking out from the farmers market. Now that I have your attention, I bet you have some questions! They typically show up in June and last through November. The popular Black Mission Fig shows up for a few weeks in June and then again in August through October, since they produce one set of fruit on new growth, and the second set on old braches. Ripe figs are very perishable and don’t ship well, so the best ones will be from local sources in regions with Mediterranean climates like California. A few southern states also can grow figs, so contact local farmers to find out who might have them. See what else is in season at the same time: June, July, August, September, October, and November. What are the different types of figs? Black mission figs are the sweetest and a crowd favorite. They are shaped like a raindrop with dark purple skin and a dusty pink interior. Brown turkey figs have a slightly milder flavor and are dark brown. Calimyrna figs are green, larger, and taste slightly nuttier. Kadota figs are also green, but are not as sweet as the other varieties. Black mission vs Brown Turkey figs: if you aren’t a fig aficionado, they can be hard to tell apart if not labeled, so ask the farmer. If you are at a grocery store, the chance of them being divinely ripe is harder, but not impossible. Black mission figs will be smaller and almost black, compared to Brown Turkeys. Fresh figs should be soft, yielding to pressure when gently squeezed. Look for ones with stems still attached and holding strong – loose stems are usually a sign they are overripe. Unlike most fruit, where wrinkled skin is a sign of overripeness, plump but slightly wrinkled figs are the best kind. But pass up figs that look shrunken or ones that have sap seeping from cracks – those are overripe. Lastly, if they smell slightly ‘sour’ they are overripe, and avoid ones with bruises. Fresh figs are so perishable that you should eat them within 1-2 days. Ideally you store them on the counter, but they won’t last much past a day there. 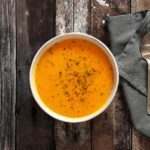 You can store them in a shallow bowl in the fridge (don’t stack them on top of each other) and they will last up to 5 days if you are lucky, however the colder temperatures degrade the flavor slightly. Don’t cover them, as they don’t like extra humidity. If you want to score extra points, set each fig in a torn open paper bag to catch extra moisture and syrup so it doesn’t spoil other figs. Yes, most people eat the fig, including the skins. Often they are too ripe to even get the peel off, so it all works out! Figs are currently not tested by the Environmental Protection Agency (EPA) so the levels of pesticides and toxicity are unknown. If you are a cautious person, you can go organic. However, if organic isn’t an option, I don’t let that stop me from having a honey, syrupy perfectly ripe fig. When you find fresh figs at the farmers market, add them to a meat & cheese board with nuts, maybe even a little honey. You won’t regret it! Each recipe has been reviewed to make sure all ingredients are in season at the same times as figs, or that the ingredients are in-season all year. This recipe calls for 1/2 a cup of fig jam (not fresh figs). I included it because it’s a good way to use the homemade version above it. Peaches are in season in summer but end before fig season is over, so make this before the peaches are gone! This recipe uses dried figs, but I wanted to include it because it’s a perfect way to enjoy these in the off-season.